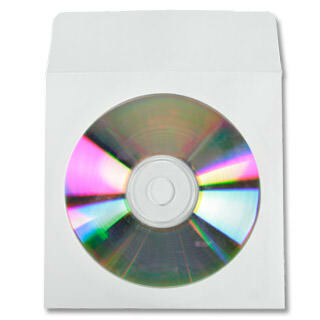 Paper CD sleeves are an optical media packaging widely used for mailing and other distribution needs. Their design is a square envelope made of paper, occasionally featuring a transparent plastic window that partially reveals the artwork or logos of the disc within. The paper also may be in a wide range of colors. They are suitable for both CDs and DVDs. Fold over flaps are another feature added to some paper sleeves. The flaps are in place to prevent the disc from shifting or falling out. The flaps do not usually carry an adhesive strip, but some are available on the market. Without adhesive, repeated removal of the disc is easy. This option is the most cost effective, low maintenance and eco-friendly option when it comes to packaging optical media. However, they are not without their shortcomings. Their presentation factor is minimal and less professional when compared to custom printed cardboard sleeves or a plastic case. A user may need to rely on the disc’s artwork to make their project stand out in a paper sleeve. In addition, its construction often makes it secondary packaging. To keep the disc from breaking, scratching, or enduring other types of damage, the paper sleeve is often only the first layer of packaging. Paper CD sleeves may be confined to in-house distribution. A user must also handle paper sleeves with care. If a disc is hastily inserted into one, tearing or abrasions may occur. However, custom printed paper CD sleeves can ramp up your project’s overall look at a budget friendly cost!